We have all been so busy it has been ages since we had a family game night. Jordan has been working 13 hours a day 6-7 days a week for the past month, Ron is working extra running sound for a lot of end of the school year events at schools in the area and I’m in the middle of VBS prep season. Saturday, after we got home from a Mother’s Day dinner with my mom, sister and her family, we finally carved out time to play Drop It. The box has been taunting us for a few weeks and we just hadn’t had the time when we were all home. We had so much fun learning this new game from KOSMOS Games. This colorful, inventive family game is easy to learn but deceptively mind-boggling! One at a time, each player drops a shape into the vertical game board’s drop zone. Players earn points for the highest level that their shape reaches when it lands and extra points for touching bonus circles. But be careful: Don’t break a landing rule! The shape you dropped is not allowed to touch matching shapes or colors after it lands. If you break a landing rule, you will go away empty-handed. The winner is the player or team with the most points at the end. 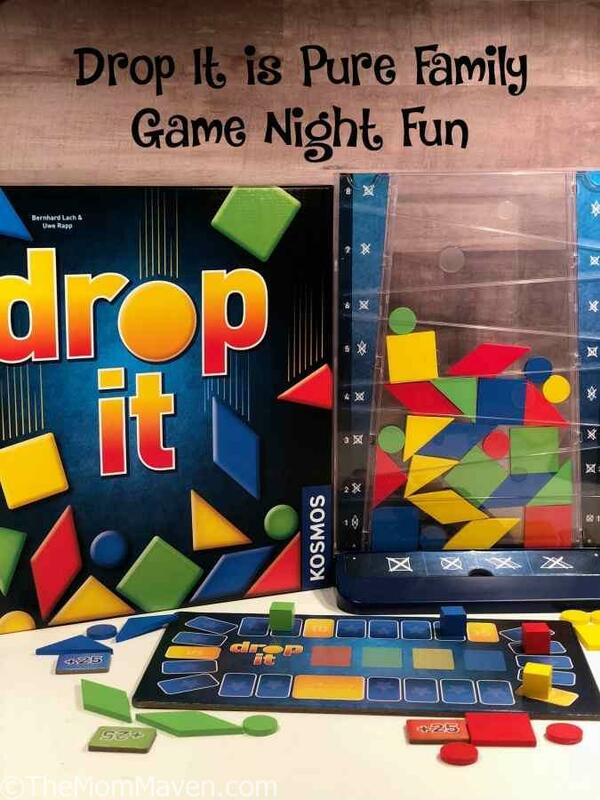 Drop It is for ages 8 and up. It takes about 30 minutes to play and is available on Amazon for $26.87. We all enjoyed playing Drop It and we can’t wait to introduce it to friends and our extended family. We do agree with the age range of 8 and up because this game can be frustrating because pieces don’t always land where you think they will and sometimes the pieces that are already in place shift and move. You have to be able to deal with that frustration in the context of the game as well as keep up with all of the different landing rules. Make sure play on a flat surface and let the pieces drop where they may. Have fun!